A necessity for your mosaic projects! We used this cement for the TRIVET 6IN SQUARE BLACK PK12 item #INTTT734. It was good in the beginning dried quickly and was easy clean up but after it dried - the cement didn't stick to the fiberboard insert all the mosaic stones cracked and came out with the cement. Used this cement at VBS with Middle School Students. I bought two tubs with hopes that would be enough for 20-25 students. We ran out so I had to purchase pre-mixed grout from a local craft store that was triple the price and awful! I suggest buying more than you think you need. It worked well in our mosaic cross craft which you can also find on this website. I'm new to mosaics so this small sized container is good. Right now I'm just doing small projects like trinket boxes. 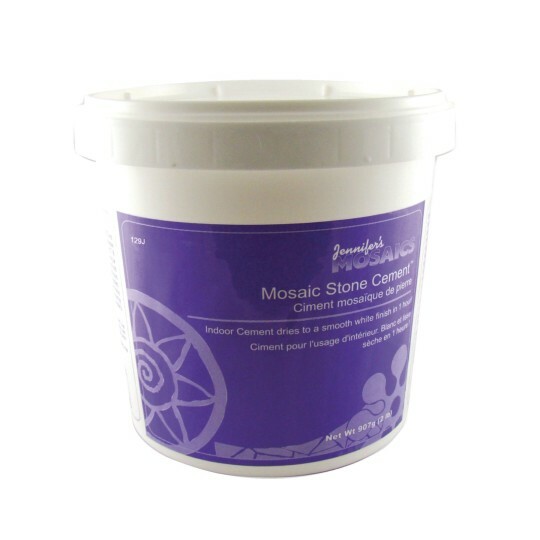 Outdoor Mosaic Cement, 20 lb.